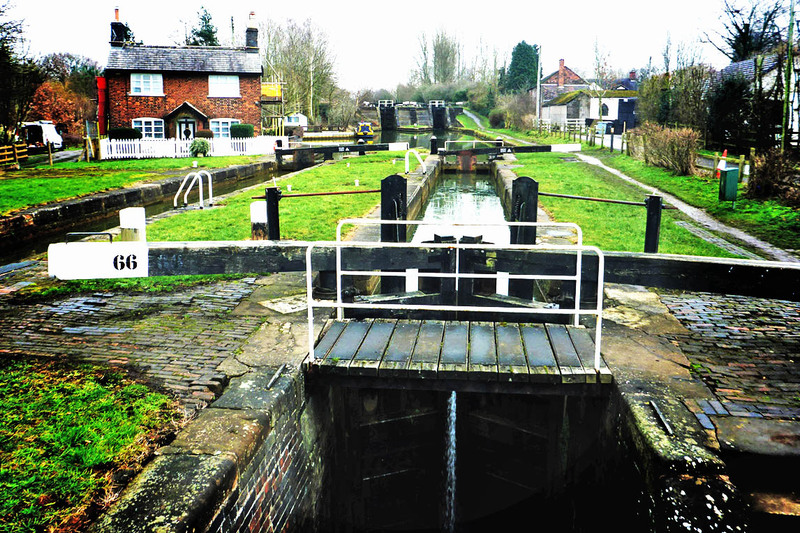 Ten locks in a row to Wheelock whereupon I promptly moored up and promptly sat down #narrowboat #England #boating #canal – The Diesel-Electric Elephant Company. A drop in altitude by my calculation of some 98′ 6″ from beginning to end. The image shown above is of the last two locks in the flight (one in the foreground, the double-chamber of the previous one in the background). Ten ruddy deep locks at an average of almost 10′ each. It was actually quite fun. Two miles and ten locks in three hours and forty minutes from beginning to untie to being moored up again. There were no other boats around and very few folk on the towpath, so I could completely take my own time, do my own thing. That is a far, far more pleasant state of affairs than usually reigns during summer or on the occasional fine-weather day when the non-all-year-round folk come out to play. I like doing my own thing. For one thing, my own thing is safer. Methodically set the lock, settle the Cardinal, open half a paddle initially, settle the Cardinal again, add the other half of the paddle until the cill is uncovered, then add the second paddle, settle him again, rope him all the way out or at miminum manoeuvre him until the lock ladder leads directly to the rear deck (no roof clambering), leave him wedged just outside the lower lock gates while I go ahead and set the next… that sort of thing. Some of the locks were still the original twin-chambers, others had fallen into disrepair and neglect leaving just one working. The design of some of these is a little bit… Ecclefechan… with curving approaches and some of the lock chambers at a different angle to their pounds. One of the locks has a particularly notable leak from high up on the lock wall, sending a constant stream of water down onto the boat as you manoeuvre through, soaking the well deck, the roof, gurgling nicely right down the damned stove flue, across the solar panels and then onto whichever unfortunate peasant is on the rear deck. Most of the locks have the (now-)customary waterfalls from the gates, testing the boat’s engine deck drainage. All of the locks are coated in the local iron-oxide red silt and, after the first couple of locks, a chap might as well just roll in the mud to cover the bits that the locks and lock ladders missed. I shan’t immediately wash the jeans that I wore; I’ll plant a crop of potatoes on them first. Honestly, it was fun! Better yet, tis now done. There’s always a boat moored near-as-damn-it on every CaRT service area. This one even had the customary loose stern rope so that the arse-end could wander out into the middle of the navigation. Wheelock is another of those “one horse” towns where the horse in question has long since worked its way through the local dog-food factory and out into general distribution. By “general distribution” I mean “…and on through manifold dogs’ bottoms”. In the Domesday Book the town was referred to as “Hoiloch” but by the year 1096 the name had morphed into “Quelock”, changing to the more modern “Whelock” by 1382. After fisticuffs among the town’s Scrabble Team outside the pub in 1390 the spelling “Wheelock” was settled upon and there’s been no time since to even consider changing it again. The name refers to the river Wheelock btw., which is what do wind around a bit through the town, criss-crossing the route of the canal. An imaginative lot they were not. Presumably, had there not been a river here then they would have called the town “Town”. The town – a scrag-end suburb of Sandbach – has its attractions. Not least of these after staggering through the last of the ten locks is the visitor moorings immediately afterwards, whereupon I moored without further ado. The fly-over of the A534 roadway is unbelievably busy (and noisy) all day and all night, but there is a mobile interwebnetting signal for which we are truly grateful. That’s the fly-over in the background of this photograph and, no, I didn’t consider going any further. For one thing, there is no “further” in terms of moorings, it’s this short stretch, then the services area, then out of town and back to the usual moth-eaten, crumbling banks! It takes more, much more, than a busy roadway fly-over to keep a Hutson from his slumbers. I haven’t called at the services area yet, at least, not with the Cardinal. Might have done so today, had I had the energy, but ergs were lacking, so no. We have winds forecast again for the next few days, so we’ll like as not be here for the duration of those, and then mooch on. Wheelock services area, a much-reduced affair with all of the other canalside buildings given over to fine heavy industries such as an Italian(esque) restaurant, housing and a “pay us £5 now or else we’ll charge you £100 and set cowboy debt-collector thugs on you” private car park. It’s all part of the sad decline since 1096. I blame the Romans. What have the Romans ever done for us? One reason for staying here is that if we are indeed to enjoy some healthy breezes the Cardinal is moored away from tall trees and other items that tend towards the unexpectedly horizontal sometimes during blustery weather. Besides, this is the canal network of England, so there’s no rush whatsoever. This is fortunate, since the Cardinal and I do not do rush. More on the town of Wheelock in the next post. It really does seem to be the most monumental… mix-up. We are almost at the end of the one-hundred and ten mile loop that I set for myself last September, back again now just a few miles away from the Middlewich Breach – that they assure me has been reliably repaired. I am making sure that it has also been reliably tested, by other people with other people’s boats, before I venture across the new sutures in the canal fabric. Once past Middlewich again the Cardinal and I shall need a new plan. Something quiet and limited in terms of movement, perhaps, for the remainder of February and the last winter flings of March, and by then spring will have sprung – and I’ll be whingeing about boat traffic and queues at the locks. Chin-chin, Ian H and Cardinal W.
No doubt named for the spontaneous cry of ‘Whee!’ when one passes through the last lock, which is the true Wheelock. Not all that other stuff you were given. Good shots of the Cardinal, there. Good grief what a hectic hector, where do you get all that energy? Is this the same person who ziggy zaggied out of the marina all those months ago and saying ten locks is fun? What an achievement and the world looks on at your progress. Excellent! That’s a good day’s work, indeed.